I wasn't sure what to call this post. You see, most everything has been installed except the pantry doors and a little crown molding, but there is still a bit to do before we can move back in. 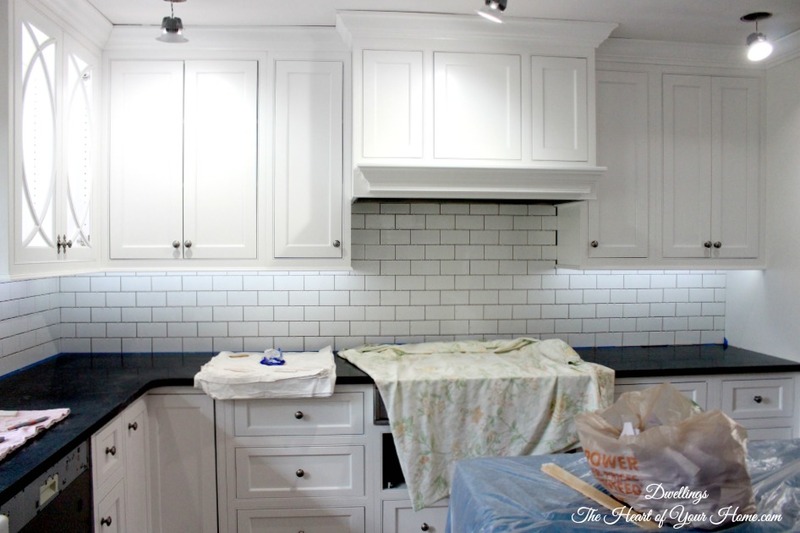 So I am so excited to share our Kitchen Reveal~ish with you! 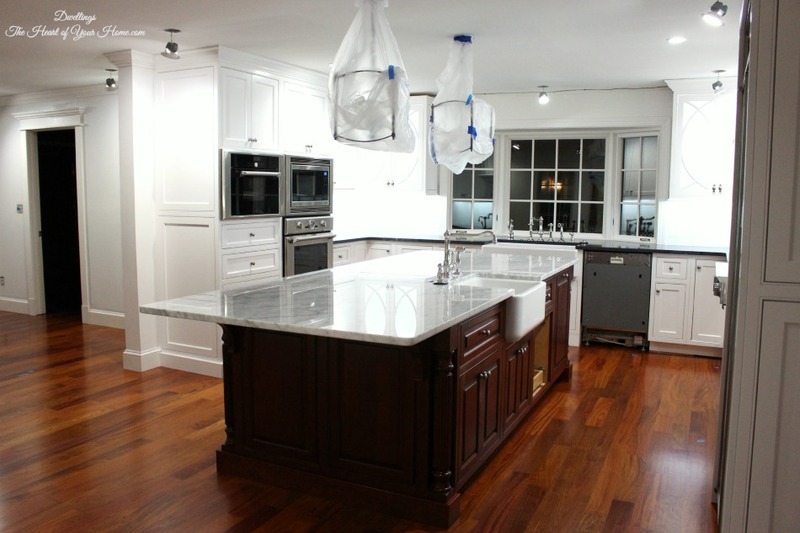 The cabinets are white shaker with a little beaded detail for the perimeter and cherry raised panel for the island. 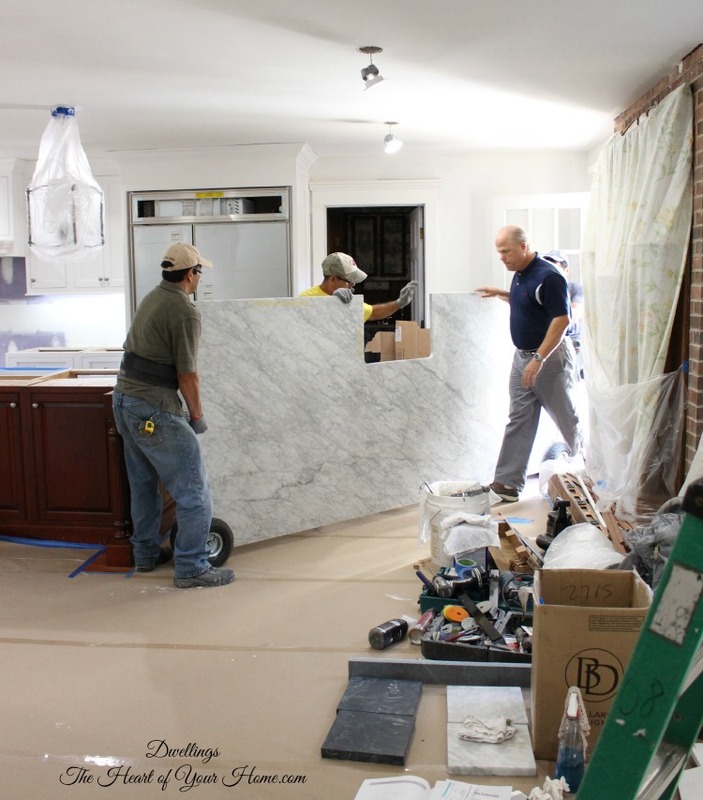 The counter tops have been installed. 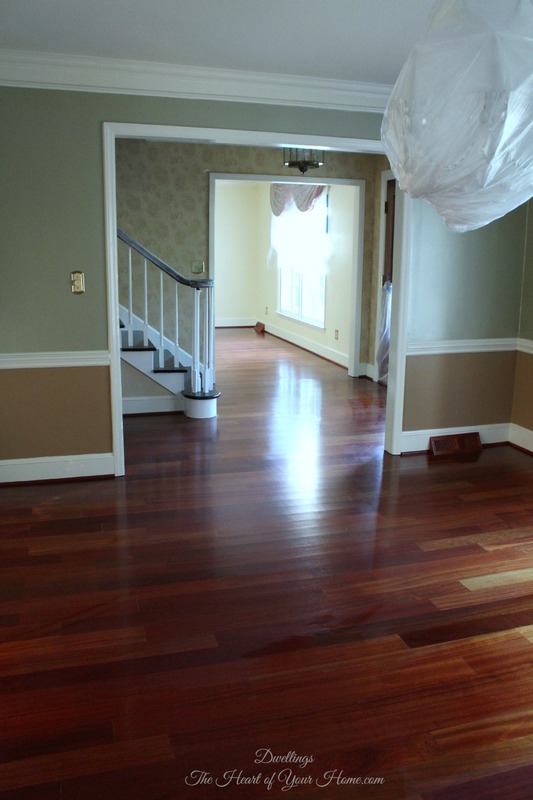 There is one more coat of sealer to be applied to the wood floors so paper is still down for added protection. 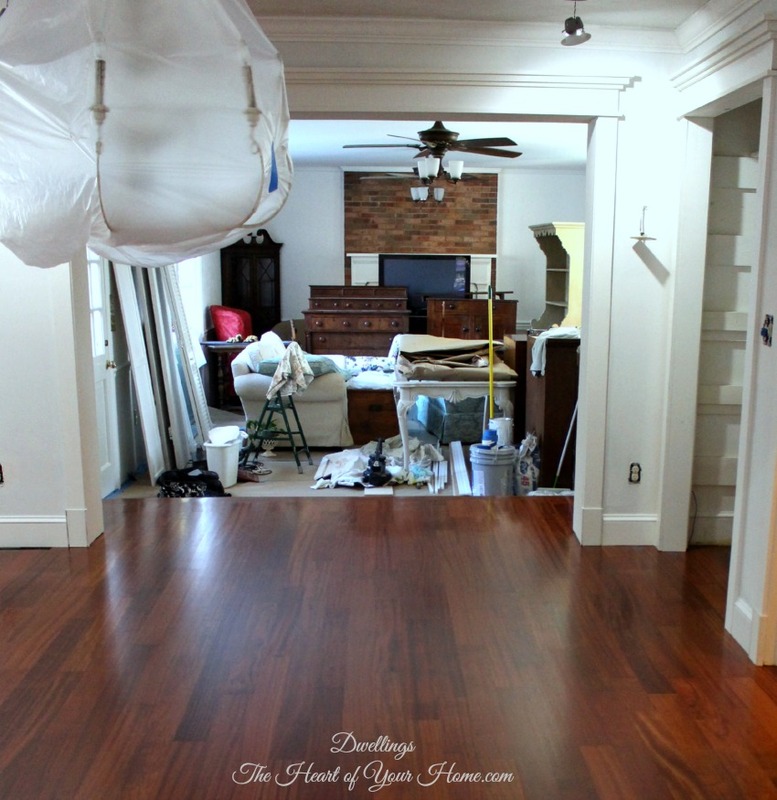 The floor guys were coming the next day to apply the last coat of sealer to the floors so the paper was removed. The little pieces of blue tape are areas they will touch up prior to adding the last coat of sealer. 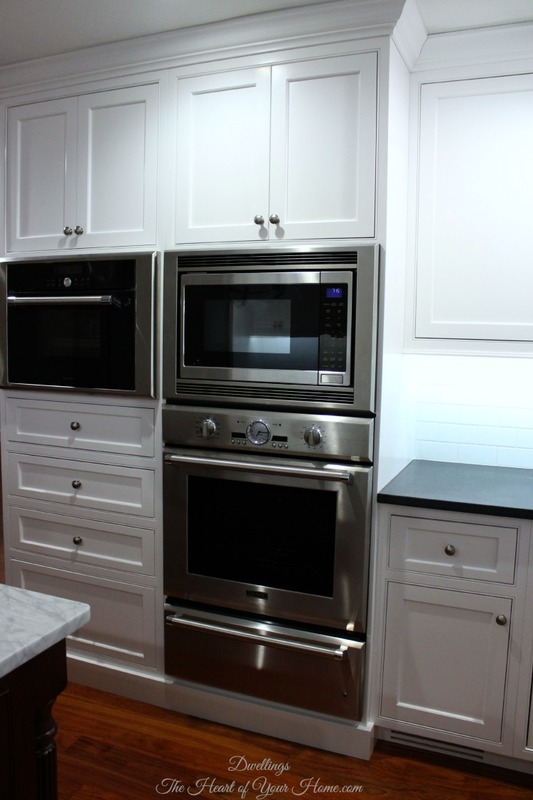 The ovens and dishwasher are by Thermador. 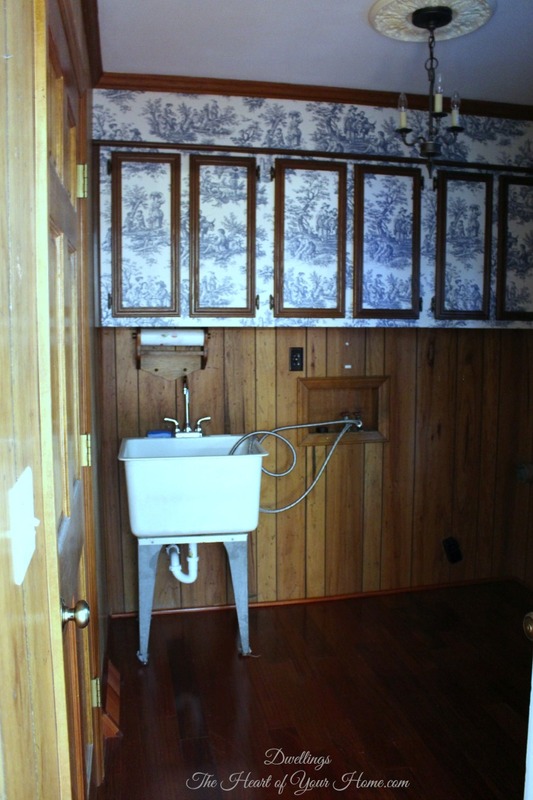 Yikes...that sink is ugly naked without it's skirt! 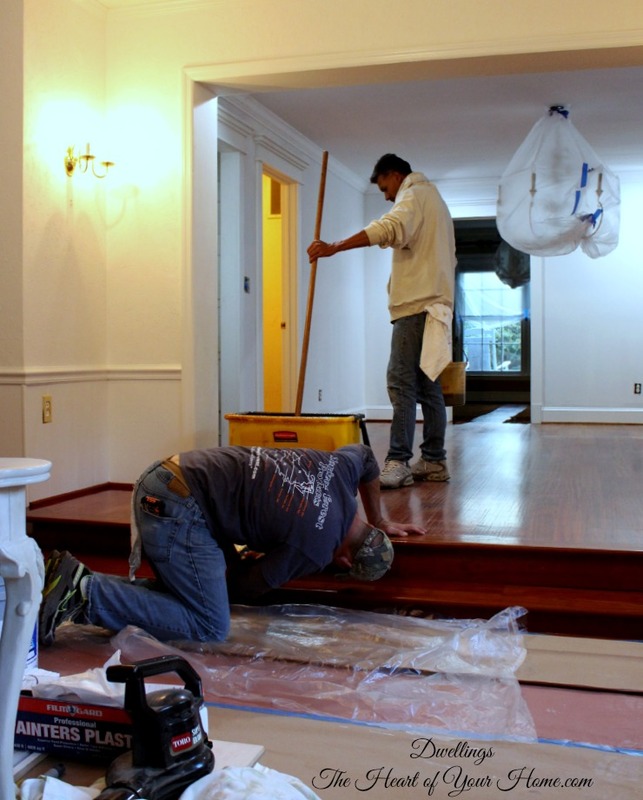 The floors have been sanded and are having the last coat of sealer applied. Thanks so much for coming by! 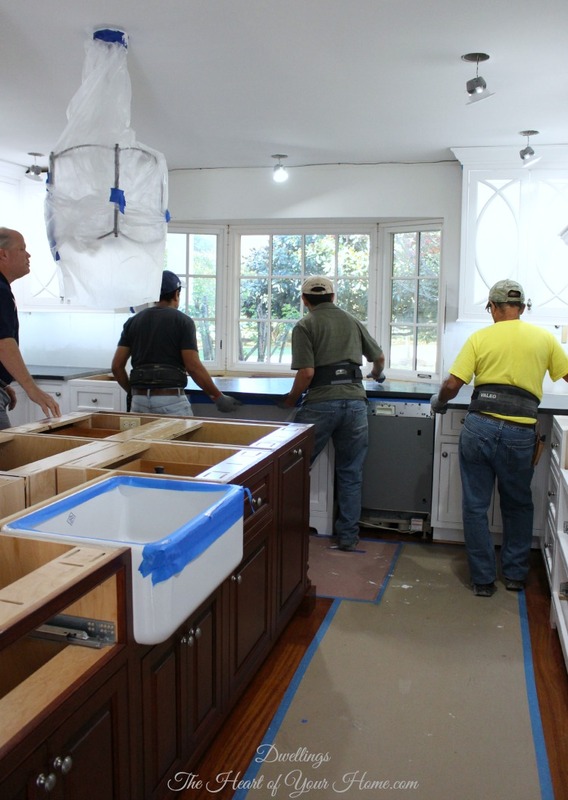 I hope you are enjoying following along with our Kitchen Remodel Diary. It's stunning all ready! 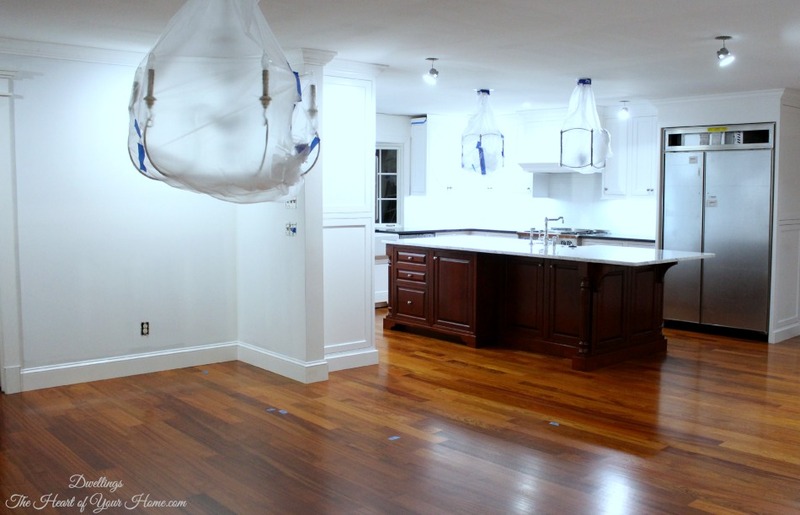 There are so many similar things I want to do when we redo our kitchen! I am just drooling over all your details...love love love it! 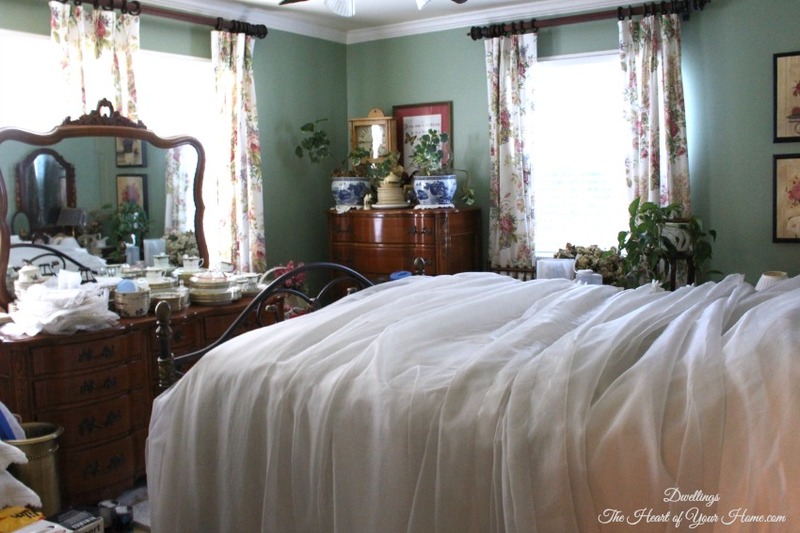 Its all gorgeous and you are very fortunate to have such a beautiful place as the heart of your home. Don't know what your experience with gas burners is, but I have a range with 5 burners and I don't really care for how tight it can be when you are cooking. I think 4 is so much better! Enjoy, especially with all the holidays coming up. Don't think I would want to leave the room! OMG it is looking amazing! WOW!!! THIS is reveal-ISH! Oh my, can't wait to see the REVEAL! Cindy, it's perfect; rich, romantic, and radiant! Your kitchen is gorgeous! 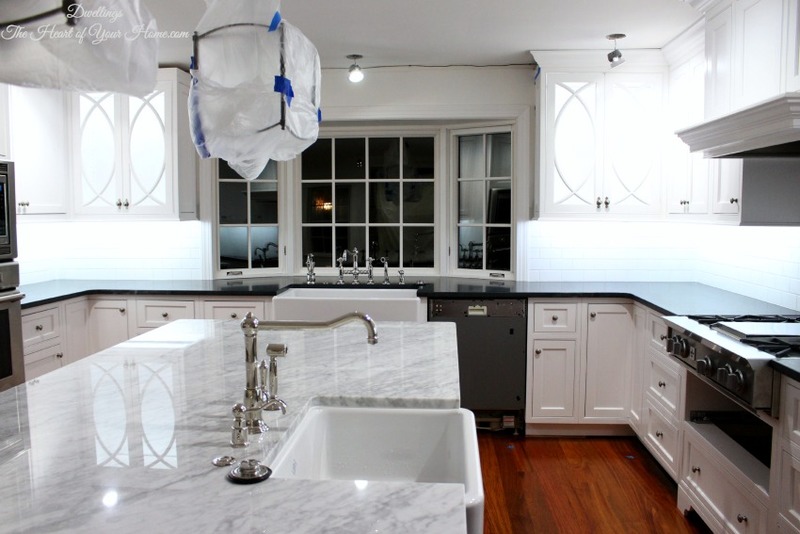 Love the countertops and pretty sink fixtures. Thermador is a great brand- very attractive too! You must be beyond thrilled! Soon enough the mess will be behind you and you'll be enjoying all this! 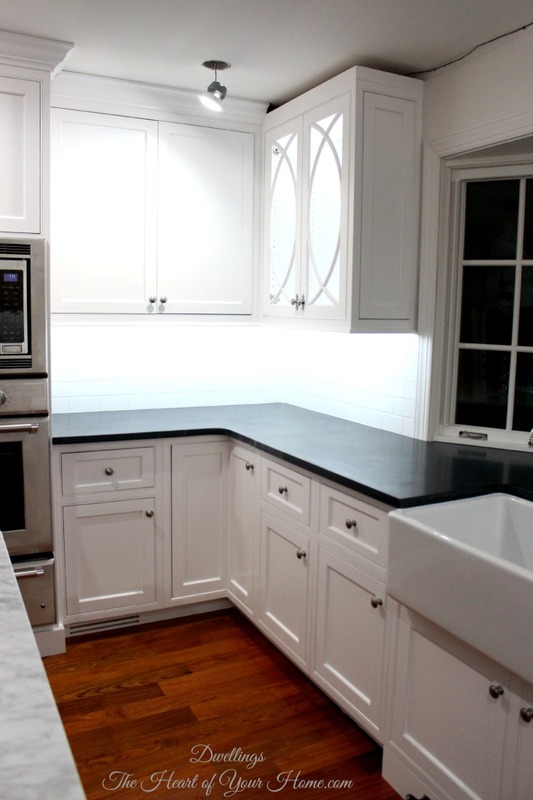 You had me at soapstone! Amazing how good everything looks even with plastic. Lovely. So beautiful! I bet you can't wait until everything goes back in place. 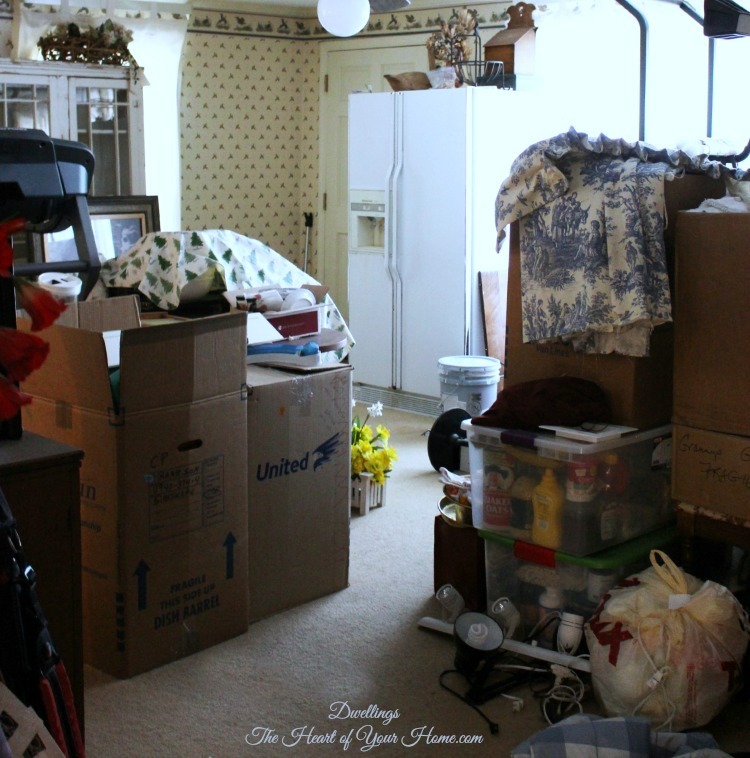 We have done this once and what a mess moving furniture and so many items. Best part was eating out. Your struggle will all be worth it. Such gorgeous floors and a fantastic kitchen. Hope you enjoy it soon. Can I ask your kitchen out on a date? My hubby won't mind until I come home from said date and tell him I want one of those. :D It's beautiful! Enjoy. Just beautiful! I love the white! 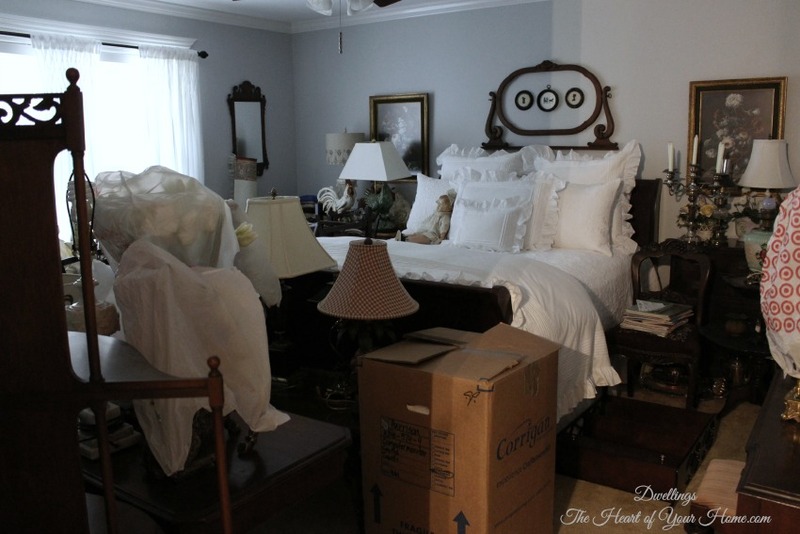 I can't even imagine living through such a remodel but you have done so in grand style. oh yeah- Your GREAT room? NOT SO GREAT!!!! 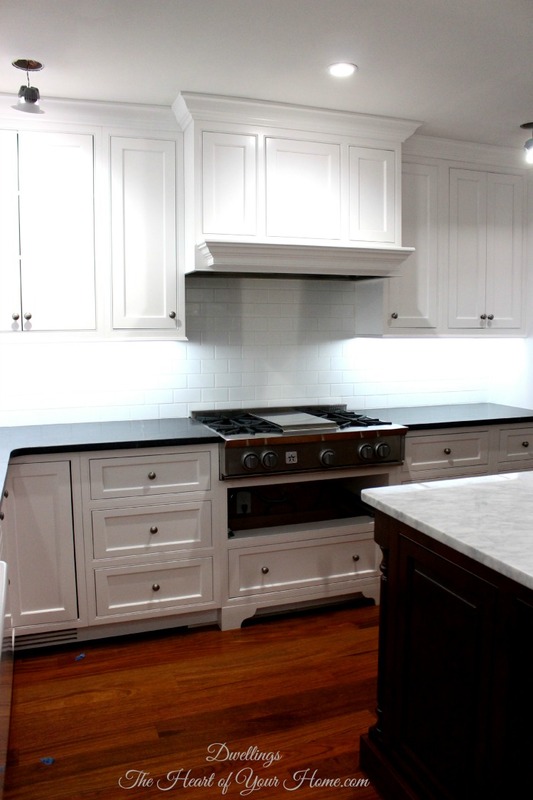 This is one fabulous kitchen remodel. I said, "Oh my goodness" so many times my husband asked me what was wrong. I can hardly wait to see the rest of the reveal . . . and I think we'll just bring our party to your house for Thanksgiving. I know you are so excited! It's so pretty, what a great Christmas for you!! Gorgeous. Absolutely stunning. I just love, love your kitchen! I can't wait to see the entire "final" reveal. I know it will be breathtaking! There is an end in sight. You must be so excited! A dream kitchen for sure! 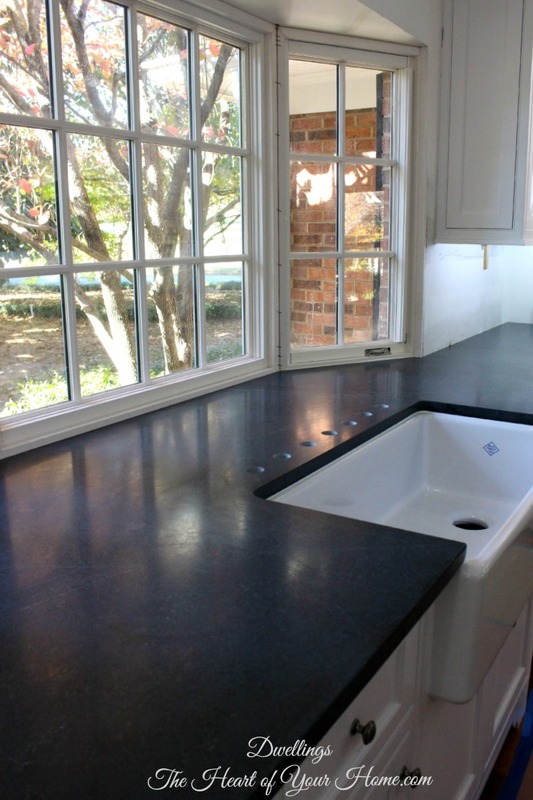 Love the counter tops and the window! The big mess will be so worth it! Love it all, your one lucky lady! Your kitchen is amazing. 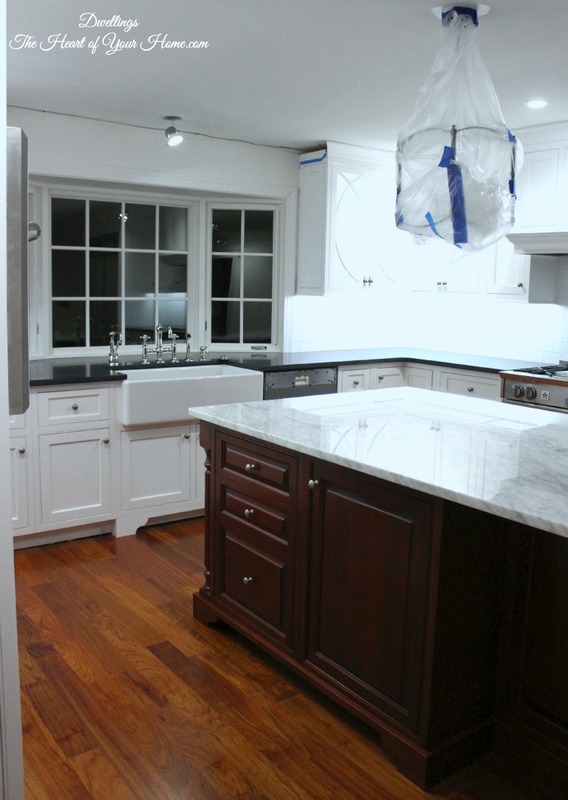 I really like the glass cabinets: they are beautiful. Hi! 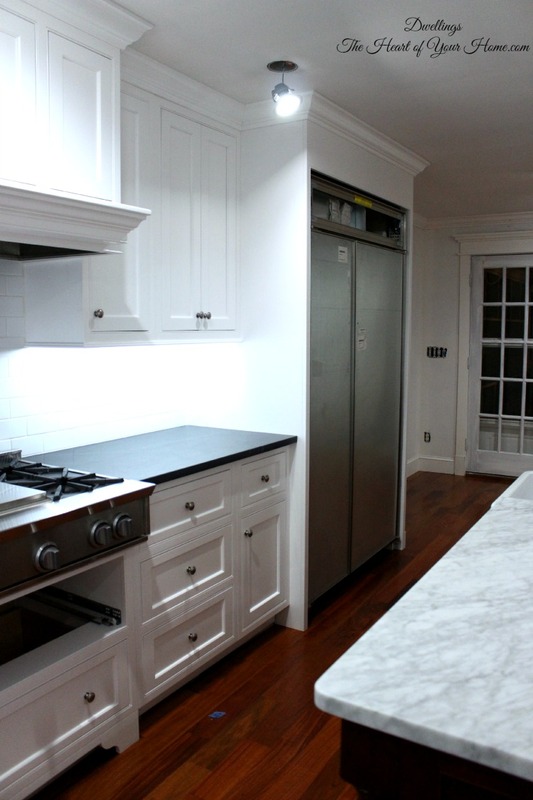 Your kitchen is positively gorgeous! Love everything about it. Enjoy every minute! OMG! It is just beautiful! Thank you for sharing! wow, Cindy, this is just breathtaking, congrats on getting through it all! 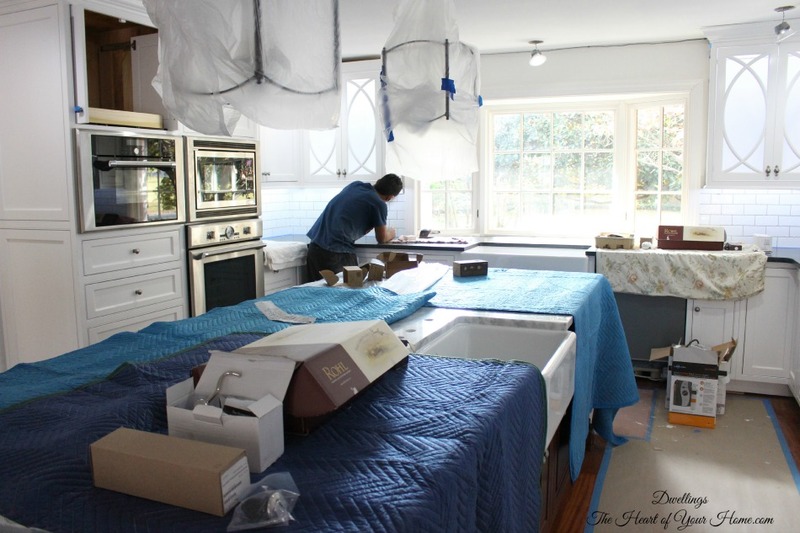 Wow...your kitchen is stunning....I love that you have two farmhouse sinks...and swooning over the marble countertop!...Can't wait for the final reveal...hope you get to move in soon!!! Your kitchen is absolutely amazing. 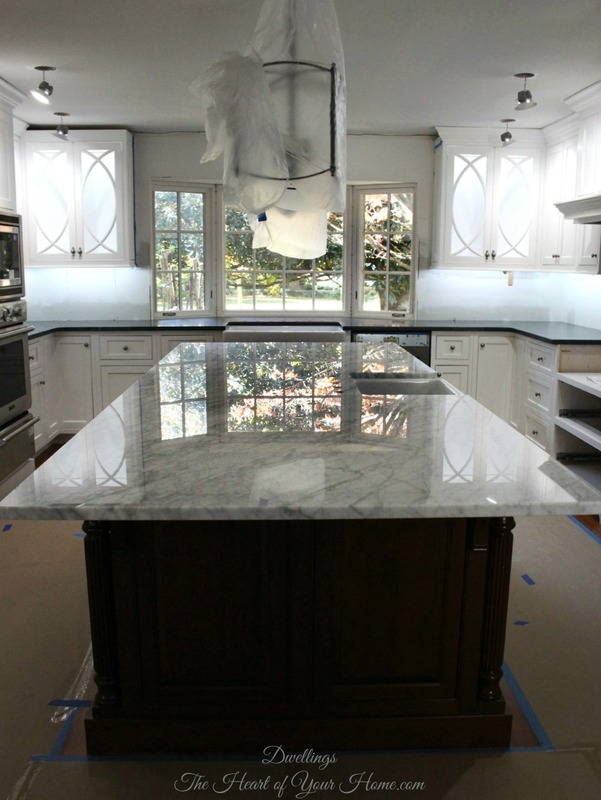 I love your marble on the island--wish I had the courage to take care of marble--I don't! What yumminess will come from this lovely space! I do feel for you though, the rest of the house is a mess and I've lived through that myself! Beautiful! I know you are so excited to be almost finished with this project. 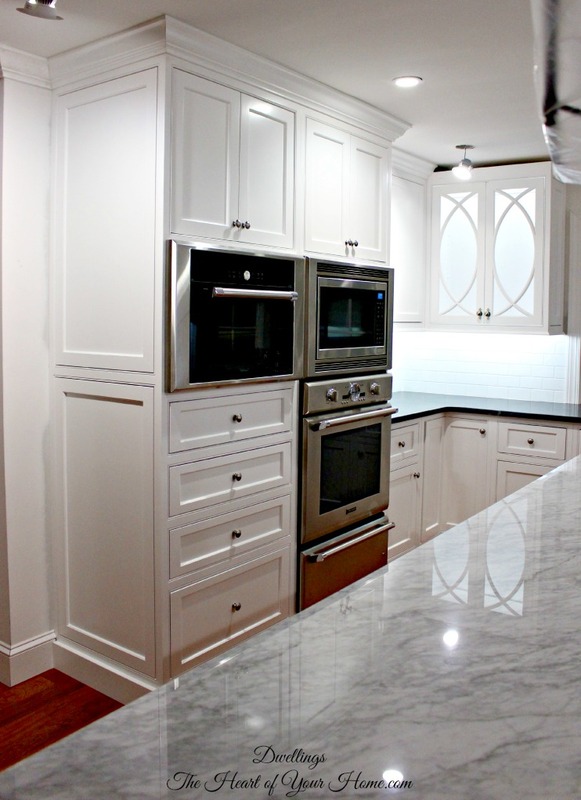 Oh, wow you are going to have one gorgeous kitchen for the holidays!! Thanks for sharing! Share it again when complete and I will feature it!! YOUR KITCHEN pictures are MY inspiration pics. Absolutely PERFECT! FINALLY , I have photos to show my cabinet maker. No more trying to make someone else understand my vision. Thanks so much for sharing!